Biochar is a highly porous charcoal made from the organic waste from any forest, agricultural or animal. Biochar is neither a carbon that is in living organisms nor fossil carbon as in coal, oil or natural gas. It’s nearly a pure carbon available in soils in the form of amorphous graphite. Fossil fuels are carbon-positive as they add more carbon to the atmosphere. Ordinary biomass fuels are carbon neutral as the carbon captured in the biomass by photosynthesis would have eventually returned to the atmosphere through natural processes; burning plants for energy just speeds it up. While sustainable biochar systems can be carbon negative because they hold a substantial portion of the carbon in soil. This results in net reduction of carbon dioxide in the atmosphere and helps in reducing the GHG emissions. Biochar can hold carbon in the soil for hundreds of years. The energy generated as part of Biochar production can displace carbon positive energy from fossil fuels. Furthermore, effects from adding Biochar to soil can further reduce greenhouse gas emissions and enhance carbon storage in soil. Biochar can contribute significantly to securing a future supply of green energy because it can effectively retain nutrients and promote an environment in the soil that will enhance plant growth. As per estimates, 2.2 gigatons of carbon will be sequestered by 2050 and around 12 percent of global GHG emissions could be offset with biochar energy. If biochar is used worldwide at present, CO₂ levels could drop 8 parts per million within 50 years. The biochar concept is simplified as per International Biochar Initiative (IBI); first you take a big old drum, then fill it full of dry cow dung, make sure the lid’s on really tight, then just stick in a small stove pipe. Light a fire under the drum, cook that cow dung till it’s done, open the door and there you are, what you’ve got is biochar. It is the carbon-rich product when biomass (such as wood, manure or crop residues) is heated in a closed container with litter or no available air. Biochar has potential for improving soils and feeding people, especially where soils are weak. The benefits of biochar can last for at least hundreds of years. The charcoal is made by the thermal transformation of biological matter, mainly carbohydrates. The woods and grasses are better biomass from which biochar is created. Initial biomass matter and carbonization conditions influence the final biochar properties and differentiate with each other. The lower the temperature, the more char is created per unit biomass. High temperature Pyrolysis is also known as gasification, and produces primarily syn-gas from the biomass. There are two main methods of Pyrolysis; fast Pyrolysis (yields 20% biochar) and slow Pyrolysis (yields ~50% biochar). 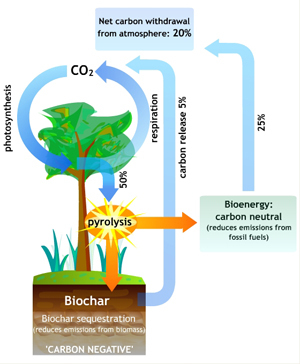 Biochar is the only current reasonable method for human action to remove significant amount of atmospheric CO₂ through carbon sequestration. Biochar can clean the air in two ways; preventing rotting biomass from releasing harmful CO₂ into the atmosphere and allowing plants to store the CO₂ that they pull from the air via photosynthesis. The gases given off during the process of creating biochar can be converted into electricity, gasoline or used in some pharmaceutical application for the by-products. 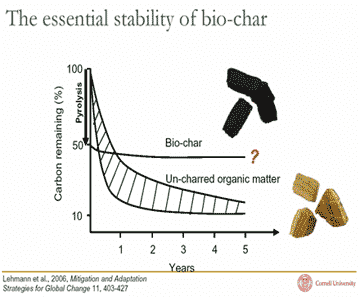 Let’s talk about the important challenges for using biochar. The scalability at which it can be produced is the main concern to replace conventional fossil fuels energy. The establishment of standardized tests, tracking & classification systems and sustainability criteria for biomass production. Emphasize on the financing for R&D activities and production plants for biochar. The chance of producing biomass solely for biochar production could potentially impact crop production (e.g. ethanol production which could reduce the available stock of crops). We can develop and increase the use of biomass in future by defining the standards and guidelines for potential applications. Also, we should create an appropriate investment climate for pilot projects and share the experience to newcomers so that biochar will be more acceptable in the world. In fact, the issues of atmospheric CO₂ concentrations will not be resolved without conscious and significant actions by all the fuel-intense nations of the world. 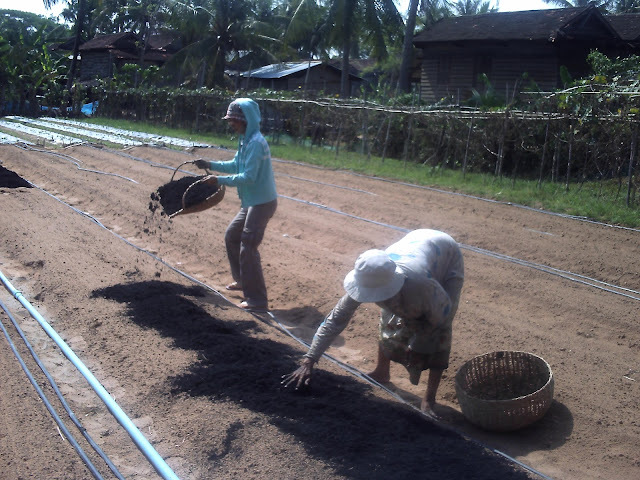 Biochar gives us the better alternate source of green energy which not only reduces the GHG emissions but improves the soil fertility and increase crop yields.